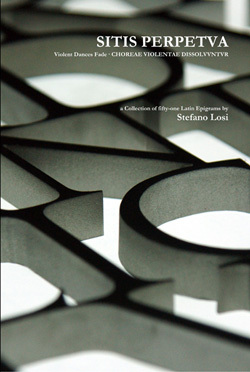 “SITIS PERPETVA” collects fifty-one (LI) Latin elegies and epigrams with English and Italian translations, exploring the existential unquietness inherent in the human condition. It is introduced by a foreword by several artists and critics, as Roberto Farano, Chambliss Giobbi and Jonny Hetherington. The 241 pages book is available as a Hardcover or as a Download (click on the respective links).